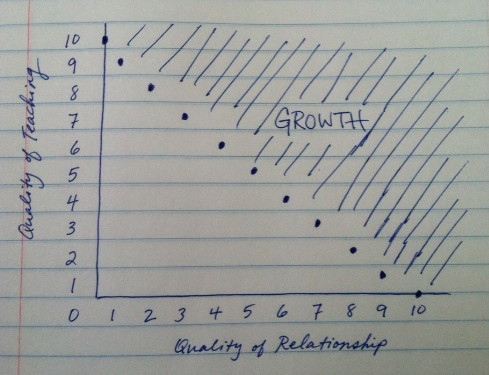 It seems that growth occurs most often at the overlap between teaching and relationships. Sometimes the teaching has more to do with the growth. 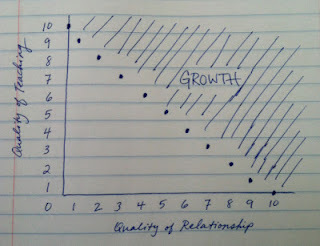 Sometimes the relationship has more to do with the growth. Usually both - the teaching and the relationships - are involved to some degree. The interesting thing is that when I think about my own growth in Christian faith, I see that high levels of quality teaching were able to offset low levels of quality relationship. Also, high levels of quality relationships were able to offset low levels of quality teaching. I have learned a lot, and my mind has even been completely changed at times, because of people I've never met. They communicated with a very high quality of teaching. My views have also been enriched by people I know very well, but whose quality of teaching is fairly low. I'm not the only one for whom this has happened. Other people I've talked with have a similar story. I have heard (and sometimes said) that, "People don't care how much you know until they know how much you care." But maybe that's not always the case. When the mechanic tells me that I need a new radiator hose, I don't wonder if he cares about me. I just need the information he has. In the same way, I've never met many of the pastors and scholars whose insights into God, Scripture, and the Christian life have helped me so much through the years. I met N. T. Wright in 2010 at the Wheaton College Theology Conference, but that was just for long enough to ask him to sign my book! He signed my book, but he doesn't know me. He doesn't care about me. And yet I care a lot about what he knows! On the other side of the matter is a lady I knew who showed up week after week to an old country church. She asked me to go with her to hear the pastor whom she raved about. I went...it wasn't good. The sermon felt like it was shot out of a shotgun! It was all over the place and there was no real point to anything that he said. But that same sermon was meaningful to her. Why? Because she knew the pastor really well, and a high quality relationship can make up for low quality teaching. The same dynamic is at work when your son/daughter/wife/husband gets up to sing a solo. That song might make the dogs howl, but you think it's great because you love that person. If you didn't know the person delivering that performance, you might have critiqued them in a way that would have made Simon Cowell proud. I think there are various places where teaching and relationships overlap. It seems to me that if you assigned a point value to the quality of teaching and the quality of relationship present, the total should be greater than (or equal to) 10 if you expect for growth to occur. The 10 can come from a 2 on teaching and an 8 on relationship (like the lady who took me to her church). Or it can come from a 10 on teaching and 0 on relationship (like my experience with books written by guys I've never met). Or it might come from 5's on both. Does this match your experience of growth?